Apart from housing some very special UK music talent, indie label Clubhouse Records have an intuitive knack of exposing seriously good North American acts to refined markets this side of the pond. On the back of Leeroy Stagger a couple of years ago and more recently Cale Tyson, next up on the Clubhouse delivery wagon is the strikingly named Don Gallardo from Nashville, Tennessee. This cool and chilled singer-songwriter is beginning to gather momentum in the UK with national radio airplay and his new album HICKORY will resonate with connoisseurs who thrive on a subtle mix of classic and contemporary. The rise of Americana as a recognised genre is a media coat hanger for artists like Don, so that their talents can be displayed prominently in the shop window. 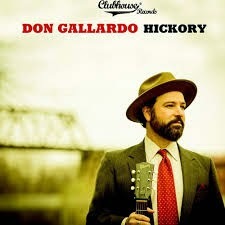 Purchasing the smooth and slick sound of Don Gallardo will be one of your best value bargains of the year. HICKORY is Don’s fourth full length release, but no doubt for many folks in the UK a first listen to his material. However there is a solid guarantee that this initial experience will be rewarded with distinct approval. Backed by an accomplished list of musicians, detailing the quality of their associations would be an exhaustive task, all thirteen original tracks ebb and flow through a golden stream of distinguished song writing fare. Perfect for lazing back on a warm summer’s evening, this scenario has been ordered for Don’s festival appearances on the proviso that the UK weather is open to requests. More guaranteed though is the listening pleasure garnered from playing this album at your leisure in one’s preferred format. Upon each listen to this album (and there are many under the bridge), two tracks shine in a consistent light of excellence each time. ‘North Dakota Blues’ is a delightful folk tale with the usual dark patches, while ‘Banks of the Mississippi’ is a dip into one of the most fertile areas for Americana songwriters and Don scores highly with this aphotic composition. In a colourful contrast, a lighter background, including a touch of sax, accompanies ‘Angel on the Dance Floor’ where a Californian sound to represent Don’s roots is more prevalent. This west coast feel also flavours the opening song ‘Down in the Valley’ which sets a laid back tone to become almost the soundtrack of the record. Such a soundtrack spans the Americana spectrum with a couple of top tunes calling at the country music truck stop to re-fuel with a bout pedal steel twang. These are namely the waltz induced ‘This Time’ and a lengthy heart breaking closer full of love and loss ‘Pearls’. While on the laid back trail, both ‘Midnight Sounds’ and ‘Will We Ever Get it Right’ possess a lounge jazz feel with the sax once again infiltrating the first and a fiddle giving the second an slight old time makeover in parts of the song. On a record which draws contemporary comparisons with some of the less frantic Old Crow Medicine Show material and definitely shades of Drew Holcomb, it is surprisingly Simon and Garfunkel which come to mind when listening to ‘Carousel’. Talking of this era, or more specific the early 70’s, ‘When the World Wakes Up’ relays absolute imagery of the classic singer-songwriter cutting the mustard. This leads in neatly to Don’s tribute to one of the industry’s greats via ‘Ophelia, We Cry’ (Ode to Levon Helm’), with the immortal tribute line ‘you left us all so suddenly with no chance for goodbyes’ saying all there needs to be said. On an album rich in lyrical indulgence, the writing goes metaphorically deep digging in ‘Diamonds & Gold’. The final track to mention ‘Cup of Rain’ does likewise in a tender ballad extolling the virtues of sharing and protection showing that there is no shying away from sentiment, especially when done well. While the two tracks mentioned at the start of the review still retain those ‘stand out’ qualities, there is so much else on offer to make HICKORY a ’stand out’ album itself. 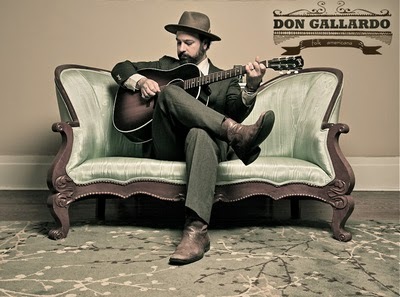 Don Gallardo is a masterful artist perfectly equipped to interpret American roots music in an impressive style to totally engage the listener.